Liam Polworth is relishing the prospect of testing himself against the best of France's emerging talent. 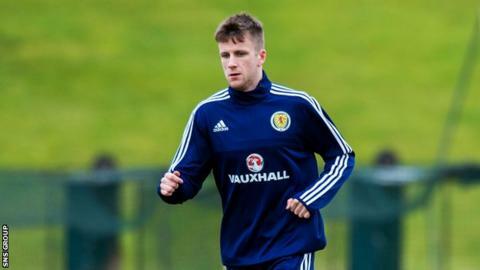 The Inverness Caledonian Thistle midfielder hopes to make his Scotland Under-21 debut in Angers on Thursday. "Everyone would look forward to playing against such a high calibre of player," the 21-year-old said. "I didn't see the first game at home but I heard Ryan [Christie] speaking about it when he came back. He said the quality was very high." Having lost 2-1 to the French at Pittodrie last year in Euro 2017 qualifying, Scotland are currently fourth in Group 2. However, Polworth insists that the squad believe they can revive their hopes of making the finals in Poland. "Every game you're going to go out and try to get three points," he said. "You know that against France it's going to be difficult, but to get a point or anything and to come back to a home game against Northern Ireland, you'd be hoping to take the three points to get us right back into the group. "Everyone is upbeat and looking forward to the game." Ricky Sbragia's side has already defeated Northern Ireland away but the loss to France and draws with Iceland and Ukraine have left the team six points behind leaders Iceland and five points behind France in second place, but with one game in hand over the two countries, and two points behind Macedonia in third. Polworth says that he has adapted quickly to life with the squad, helped by sharing a room with his former Inverness team-mate Christie, now at Celtic. He does admits that he feared missing out on international recognition, despite having established himself in the Inverness starting line-up this season. "Once you start playing, you need to get to a level where you need to be showing [your best] on a weekly basis, and that was just in time," he said. "I feel that over the course of this season, I've been on the bench a few times, but apart from that it's been week in, week out and hopefully my performances have shown that I'm there to play every week and not be a bit-part player." Polworth also revealed that Caley Thistle manager John Hughes had little sympathy for him after accidentally punching the player while celebrating an equaliser in the 1-1 draw with Hibernian at Easter Road in the Scottish Cup quarter final. "[I had] a real sore face, for about a week after, but he just seemed to find it funny," Polworth said. "There was nothing I could really do about it. No chance [of an apology]."